Click here to view the BOA Gala photo gallery. The University of Alabama’s Division of Community Affairs Board of Advisors (BOA) undertook a new endeavor on Sept. 10, holding its first fundraising gala in downtown Birmingham at the Harbert Center. The group utilized the theme “Coming Back, Giving Back,” which has been its mantra, for this occasion. Nearly 400 people attended the event, which raised $10,000 in advance of the evening while also collecting additional donations at the event. All will be used to support student-centered initiatives of the board. Community Affairs Vice President Samory T. Pruitt, PhD, established the board in 2016. It is composed of UA graduates who, as students, provided exemplary leadership and service to the University during a period of accelerated growth and change in the student body from 2003–2013. “Dr. Pruitt had a vision before any of the rest of us did to bring young leaders together who wanted to go ahead and plug back in and make a difference,” said Board President Katie Boyd Britt, a former UA Student Government Association president, who earned her undergraduate degree in 2004 and her UA law degree in 2013. Currently, she serves as chief of staff to U.S. Sen. Richard Shelby. These tremendously successful and talented alumni have come together not just to raise funds in support of campus-wide initiatives that will increase student success and retention, but also to facilitate student involvement in entrepreneurship and innovation, and to develop thoughtful global and community leaders. The group has funded scholarships for undergraduate students and continues to seek new ways to support the University in other capacities. “Everybody here on this board obviously has day jobs, but each of them is trying to find ways to use what they do during the day to make an impact on the University by night. People are coming from not only all over the United States, but all over the world, to make sure they have an opportunity to give back in this way,” Britt said. To date, members of the Board have donated personally — both in financial resources and time. The group offered its first study-abroad and domestic-study opportunities earlier this year to two UA students to help them develop leadership skills and cultural competency. Additionally, one member has committed to endow a scholarship for underrepresented students from the Birmingham area. 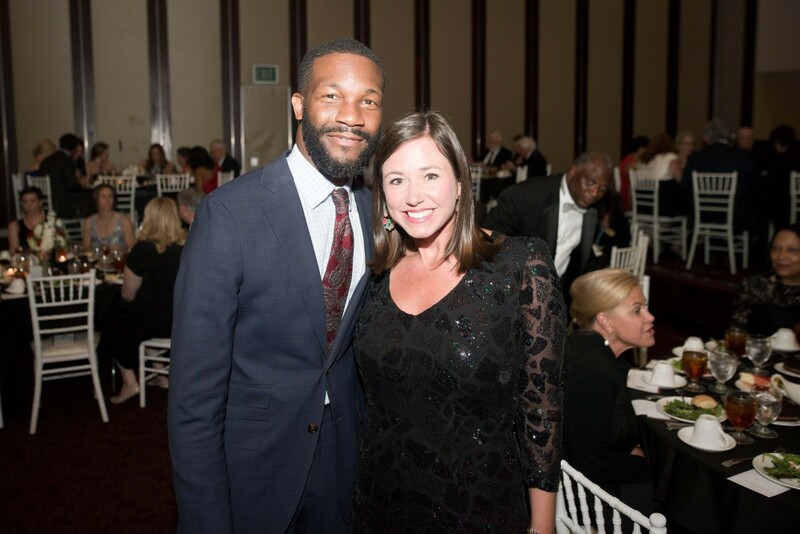 The gala was attended by alumni and supporters of the University, including Birmingham Mayor Randall Woodfin, who brought greetings on behalf of the Magic City and spoke about the city’s partnership with the BOA and Community Affairs. “We are all here today because we share the same passion for education, for workforce development and the development of the next generation of leaders. You all keep a finger on the pulse of global trends to help our emerging leaders remain competitive,” said Woodfin, 37, who was elected mayor in 2017. Woodfin said he joined the group in their passion to keep the best and brightest young people working in Alabama, and applauded the group’s ability to open doors of opportunities to our next generation of leaders. “I imagine that’s not an easy task, but this advisory group was created for that challenge,” he said. Woodfin explained that he has partnered with Community Affairs to bring students to Tuscaloosa in a shared effort to expose young people to additional college choices outside of Birmingham. The evening was not only a celebration of new initiatives; it also was a time to reflect on the successes of the board’s first three years. Among the guests at the gala were several UA vice presidents and deans. The evening ended with a performance by UA graduate, Grammy-Award nominee and Motown singer-songwriter Sebastian Kole, who entertained the audience with original songs and upbeat popular covers. In speaking about the makeup of the board, BOA Vice President Joseph Bryant shared, “The board is not political, it’s not self-serving, we are from diverse backgrounds, we have different views and live in different locations, but we are all gathered here because of our love for the Capstone and our home state of Alabama.” Bryant, a 2001 UA graduate who served as the first African-American editor of The Crimson White, is now the interim vice president of Community Engagement for the Housing Authority of the Birmingham District.